-"Power Handling" is a self-described figure to the speaker system by definition. “Power Handling” figure, simply represents how much power may be input to the speaker without damaging it, under a continuous working condition. - For example, Maximus-Monitor has been rated: ≥ 100 watts as the “Power Handling” figure; since Maximus-Monitor has an average 4 Ohms impedance which shall drain about two times current from the amplifier, one can therefore use (at least) 50-60W per-channel amplifier (rated at 8 Ohms) to drive Maximus-Monitor safely. - Since music content is not under a continuous but normally in a dynamic form during reproduction, the average driving power is much lower than the peak driving power then. Using a higher power amplifier (80-150W output, for example) may still be safe to match with Maximus-Monitor; what is needed for this higher amplifier output, is that you shall pay more attention on your volume control during playing music. - M&D speakers are very durable and that has already been a well-known fact to audiophiles; we did receive a few reports from audiophiles that they had blown the fuse of their partnering high power amplifier under full operation, yet hardly damaged the M&D speakers. - One important thing to note here, the “Power Handling” figure does not implicate one speaker may not be distorted while under full operating, how large an undistorted SPL output depends on the linear excursion and cone size of the driver(s) of the speaker; nor this figure is directly relevant to finding the right partnering amplifier. - There are similar descriptions by different speaker makers. From above, we can understand the speaker is quite receptive to input power since it may endure 250W in peak with 100W “Power Handling”. It also implies a relatively reasonable efficiency since it can operate on amplifiers with as little as 40W output. However, even more confusion is resulted in the actual pursue of a proper partnering amplifier for this speaker since the manufacturer has specified such wide power range! - The “Speaker Efficiency”, is the major parameter for your reference on the partnering amplifier. Take Maximus-Monitor speakers (at 85dB in efficiency) under stereo operation for example, they can reproduce up to 105dB output with 100W driving current per channel; however, this equals about 50-60W (at 8 Ohms) for the true high current (transistor) amplifiers to drive the Maximus-Monitor under 4 Ohms load. When considering the extra margin to allow music dynamics during reproduction, an amplifier rated 80-100W (at 8 Ohms) per channel is probably more ideal in matching with the Maximus-Monitor speaker. - Now we know the deciding factors in the power range of the partnering amplifier based on the “Power handling” and “Efficiency” parameters; then “How loud does one speaker actually sound” shall be the next major concern to us. In M&D’s opinion, the undistorted SPL output capability is one of the essential factors for evaluating a true hi-fi speaker system, other than the sonic quality. 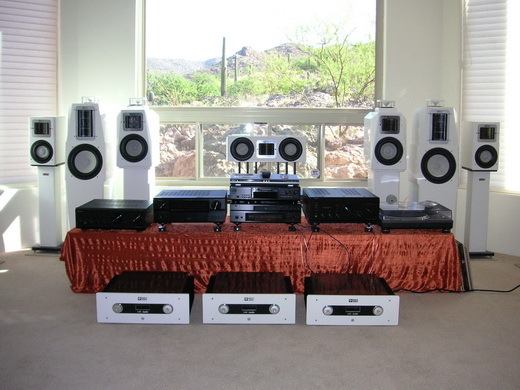 - In addition, knowing your speaker’s output limitation shall allow you to optimize your sound system at the same time. It is a kind of waste to match an over-powered amplifier with your speaker that far beyond speaker’s actual SPL output capability. - It is not often that you can get the maximum SPL figure from speaker makers; and even this figure (on how many dB) is provided, it may not represent the speaker can reproduce such a high sound pressure level (SPL) for the complete frequency spectrum, especially to the deep bass end. - For acoustic engineers, they can predict the maximum undistorted SPL capability based on the woofer(s) cone size and linear excursion (Xmax) figure of one speaker. For audiophiles however, all you need to bear in mind is: the larger SPL and/or larger Xmax figures the better. - Speaker is basically an E-M vibrating mechanism in natural. The SPL limitation in a simple two-way speaker comes from the lowest frequency ends of both the woofer and tweeter under high SPL operation. - The highest SPL limitation is not likely to be reached in our speaker’s tweeter domain since M&D’s Dreams driver is utilizing very large moving diaphragms. The woofer(s) are more likely to expose themselves to SPL limitation due to extreme low frequencies. How tolerant the woofer(s) will behave depends on the allowable range of piston stroke of the woofer’s cone, which in turn decides the extension of bass and the magnitude of sound pressure output. This is why our Super Xmax woofers are developed in order to allow maximized SPL output capability even to the deep bass end! (4) In conclusion, you need first to shortlist the amplifiers you have in mind based on optimized power range. In the end, there is really no definite rule in deciding the ultimate partnering amplifier for your speaker system except to trust your ears. We have customers sharing their experiences with us and their success stories vary from partnering mid-power vacuum tube amplifiers or digital amplifiers with relatively low efficiency M&D speakers, as long as peak volume dynamic music reproduction is not their essential requirement. On the other hand, if your partnering amplifier is powerful enough, you can truly appreciate your M&D speaker’s undistorted SPL output capability over the complete frequency spectrum.